Get ready to bundle up again. Another arctic cold front will make its way through the Rio Grande Valley beginning tomorrow bringing frigid temperatures to the area. 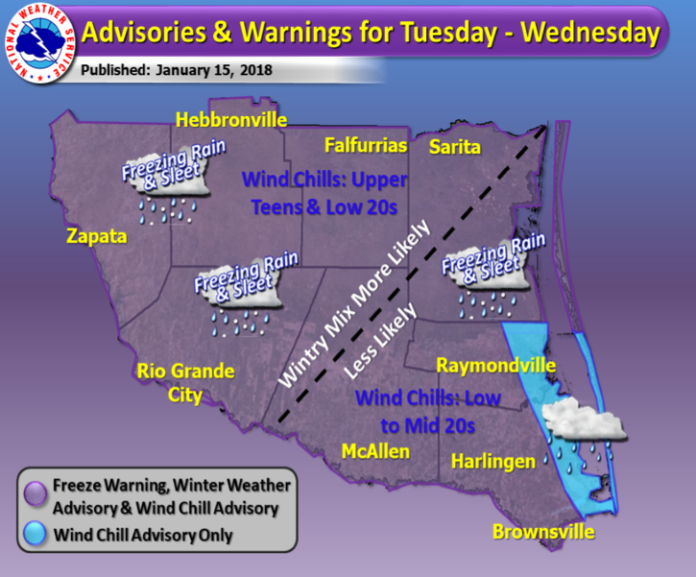 The National Weather Service in Brownsville has issued a wind chill advisory for the Valley which will be in effect from 3 p.m. Tuesday until 6 a.m. Wednesday. The NWS reports the combination of the cold temperatures and the persistent northerly surface winds will produce dangerously low wind chill values in the teens and 20s Tuesday Night through sunrise Wednesday. The wind chill values will remain in the 20s throughout the day Wednesday. The high temperatures for Tuesday will be around 60 degrees early in the day but will then steadily drop through the rest of the day. The lows for Tuesday night will be in the upper 20s to lower 30s. The temperatures on Wednesday will be in the mid to upper 30s.